The team that worked on PaRappa the Rapper, artist Rodney Alan Greenblat and musician and game designer Masaya Matsuura, are working on a music based game exclusively for the Wii. The still unnamed game is expected late in 2008. There are pretty much no details about the game, yet, but I’m sure it’s going to be totally awesome and radical. 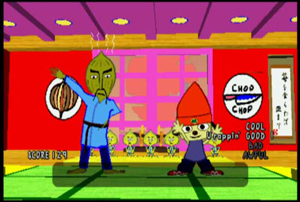 I loved PaRappa the Rapper so much, it inspired me to start my rap career. Majesco Entertainment Company (NASDAQ: COOL), an innovative provider of video games for the mass market, today announced a partnership with legendary multimedia musician and game designer, Masaya Matsuura, and famed New York artist Rodney Alan Greenblat, to develop and publish an original music-based video game scheduled for release in late 2008. Creators of the highly acclaimed, best-selling PaRappa the Rapper series, Matsuura and Greenblat will bring their engaging gameplay and distinctive art style to the Wii(TM) home video game system for the first time. “Matsuura-san and I share similar artistic perspectives so I welcomed the opportunity to re-team with him and NanaOn-Sha to produce a one-of-a-kind music game designed from the ground up for the Wii system,” said Rodney Alan Greenblat.